The beginning of the year is always a good time to make change. I have always been a cold turkey kind of person, but I understand that is not realistic for most people. I am also a big believer in baby steps, if the cold turkey method does not work for you. It has been proven that it takes 21 days to create a new habit. We as Americans, create an incredible amount of waste and toxins. We are even exposed to toxins that most people don’t realize are there! These are both very big topics to cover at one time, this article is 6 pages long on google docs! Let’s start with waste, I think waste is something we can all agree on, because it’s something that we can see. I am guilty of this too, every Tuesday the big ol’ garbage trucks drive down the street to empty our cans. I am proud to say that we don’t put them out every week, we will go 2-3 weeks sometimes without needing put our cans out. Before we get much further, let’s define waste. Waste, in my book, is defined as something that can not be reused, repurposed or given away. Your recycling bin does not count as waste, assuming you know what can and cannot be recycled. You can actually go online to your waste management company’s website for a full list of what can and cannot be recycled, it can differ by state, and even differ by county. Compost is another great way to properly dispose of most “wet” garbage, if you do not want to compost at home, you have a few options. Some grocery stores will take your compost, as well as local co-ops. If you cannot stand the thought of a bucket of decomposing food under your kitchen sink, keep it in your freezer! (Hello, brilliant I know.) Your other option is to put the compostable materials in that third bin than most people only put grass clippings in, mine is green, the one I grew up with was brown. Yes, you can put compostable food in there! Between your recycling bin, and your compost bin, you really should have very little trash! Now, onto the toxins! I feel this is a more controversial topic, because most of these toxins you can not see, and do not know they are detrimental until it is too late! There are SO many toxins I could talk about, however, I am going to touch on two, BPA and EMFs. BPA stands for bisphenol A. BPA is an industrial chemical (it is actually a version of estrogen, YIKES! no wonder girls are starting their periods at the age of 8 and young boys are developing breasts!) BPA has been used to make certain plastics and resins since the 1960s. BPA is found in polycarbonate plastics and epoxy resins. Polycarbonate plastics are often used in containers that store food and beverages, such as water bottles, plastic bags and cans. Not only do most commercial grade products contain BPA, they are typically not recycled and end up in landfills that create more toxins. Basically, if we are not being harmed by BPA in the food that we eat, or the beverages that we drink, we are being harmed by the improper disposal of them. The #1 reason to drink/eat from BPA free containers, is because as soon as the BPA is heated up, it leaks into your beverage or food. Is your plastic water bottle rolling around on your car floor during the summer before you refill it?? Or maybe you are cautious to not drink from a plastic water bottle after it was exposed to heat, but was it exposed to heat as it was being transported to the grocery store?? We don’t know! Yes, most cans and bottles are recyclable, so you are creating less waste, but what about the toxins that you are consuming before you recycle them! Most American suffer from some sort of toxic chemical overload. If it is not from BPA it is probably from EMFs! EMF stands for Electromagnetic fields, EMFs are a type of radiation. We are constantly surrounded by cell phones, bluetooth watches, tablets and laptops that are emitting EMFs. Not only are we surrounded by them, but they are usually touching our bodies! (Side note: I no longer sleep with my cell phone anywhere near me, it is in another room or turned off!) We go to work, the gym or attend church in buildings that are straight up toxic. Most people work in front of a computer, with a bluetooth strapped to their head or with a cell phone on their hip. We go to the gym to get healthy, yet there are TVs hanging from the ceilings and everyone is using their cellphones to listen to music! (This is why I no longer workout at a gym, I either workout in my own backyard or at a studio.) Last but not least, new buildings, such as movie theaters, performing art centers and churches are toxic! From the chairs, to the walls, to the media centers, and don’t forget the scented “plug-ins” that line every bathroom outlet. Unfortunately, unless you are the boss, we are not in control of those things. However, we can take a stand in our homes, and how we operate on a daily basis. EMFs also interfere with sleep! PLEASE do not fall asleep with the TV on, sleep with a laptop or tablet in your room, or with you cell phone anywhere near your head!! Now, I know that was a lot to digest! If you have made it this far, congratulations! You have made it to the fun part, what can you actually do to limit waste and toxins? Don’t feel as if you need to do them all at once, (cold turkey method.) Figure out what works best for you, your family and right now. I have listed them in order from easiest to more complicated, (in my opinion.) PLEASE remember, to either use up or donate old products, please don’t throw anything away that is still usable! There might be a family, college student or newly married couple that would really appreciate your old things. Reusable Bottles that are either glass or stainless steel: Brands I recommend are Think Sport, My BKR, Lifefactory, Kleen Kanteen and Hydro Flask. 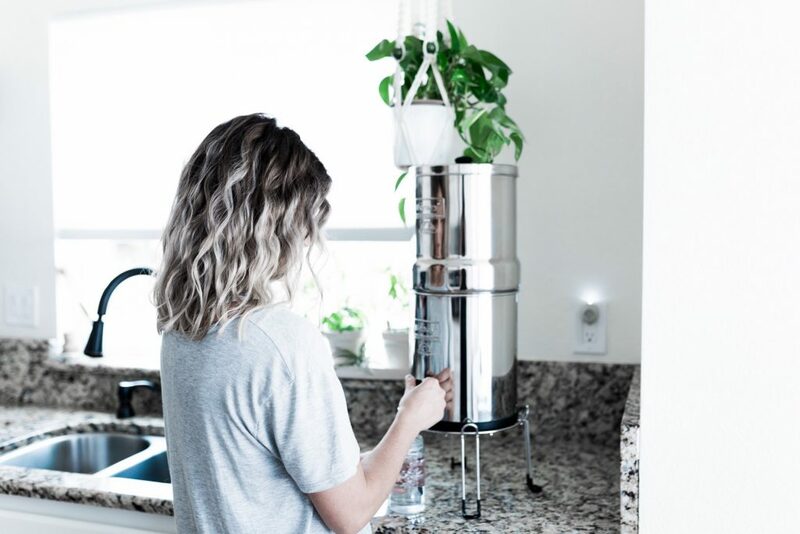 Berkey Water Filter: Turn pool water, tap water, creek water and river water into pure drinkable water. Reusable Bags: You can find them at almost any store these days, if you do not want one that is brand specific, World Market has reusable bags that are non-logoed, these also make GREAT bags for gifts! Some of my favorite bags are from World Market, Whole Foods and lululemon! Reusable Produce Bags: I recommend organic cotton bags, that are either mesh or solid, depending on what you are buying. I looked all over town yesterday and could not find any at a local store. Amazon Prime definitely has the best quality bags and the best prices. Just be sure to reuse or recycle the box they ship it in! The brands I prefer are Simple Ecology and Eco Bags. Use Mason Jars for EVERYTHING: Bring them to the grocery store for bulk items, spices, and meats. Instead of buying OJ in a plastic bottle, you can bring a 32oz mason jar to your local juice bar, and they will fill it for you with fresh squeezed juice. Keep a few in your car for water, coffee, or to take home leftovers. Don’t forget to use them for TAKE OUT! There is nothing more toxic and less recyclable than styrofoam! Styrofoam will heat up from the steam coming off of your food, yuck!! The best way to make this happen is to go to the restaurant and place your order so you can hand over the jars or containers immediately. BYO cup/mug for coffee/tea: Obviously the best option would be to use a french press at home and the compost the grounds. However if you are on the go, bring your own stainless steel to-go mug (make sure the lid is also stainless steel or BPA free), or my favorite a mason jar and a CUPPOW jar coozie! Don’t wrap gifts: Ideally just skip the wrapping all together, and do the whole pull-out-of-your-bag or behind-the-back-trick. If that does not work for you, either use a reusable bag, which is going to be the same price, or reuse a brown paper bag or newspaper. Just be sure to tie the bag with twine and not tape! Use dryer balls instead of dryer sheets: Wool dryer balls will not only cut down on dry time, but will reduce stack and are 100% toxin free. They are easy to make, or you can purchase them, they are typically in the laundry isle. You can also buy homemade dryer balls on etsy, some are even infused with essential oils if you can’t get away from the smell of dryer sheets. Use a Bamboo toothbrush instead of a plastic toothbrush: Plastic toothbrushes get thrown away, and will end up in a landfill, and they probably have BPA in them! Not to mention the dye that they use on the brush itself. Bamboo toothbrushes are biodegradable, aka you can compost them, and they can be found at any health food store or online. Menstrual Cups instead of tampons and pads: This is a subject I have been wanting to talk about for over a year. Tampon and pads are made from genetically modified and bleached cotton! Why would anyone want to put something like that near a reproductive organ?! Yes, there are organic tampons and pads, but after they are used they go into the trash. Plus, cost wise, it adds up over time! The best thing to use is a menstrual cup, they are silicone and BPA free, they are safe to sleep in and wear up to 12 hours. (I would only do that on occasion, 4-6 hours is safe, to cut down on bacteria.) They are easy to insert and take out, all you have to do is dump it out in the toilet and then wash it with hot soapy water in the sink. The nice thing about being able to wear them for longer periods of time, is that you can empty them at home. You can boil them between uses for sterilization and they will last you up to 10 years! There are only two sizes, pre baby and post baby. I recommend the brand, Diva Cup. There are also disposable menstrual cups, again they will have to go in the trash, but you only need 1 disposable menstrual cup for every 4 tampons. This is also a good way for women to get use to a menstrual cup before converting to a reusable one. It is also nice to have a few on hand incase you have an unpredictable cycle, you can keep a disposable one on hand for emergencies.